FILE - Bones, suspected to belong to members of Iraq's Yazidi community, are seen in a mass grave on the outskirts of the town of Sinjar, Nov. 30, 2015. The Iraqi government had resisted calls for the U.N. probe and the head of the investigative team stressed that much effort had been deployed to ensure cooperation from Baghdad. The United Nations has described the massacre of the Yazidis by IS jihadists as possible genocide and U.N. rights investigators have documented horrific accounts of abuse suffered by women and girls. 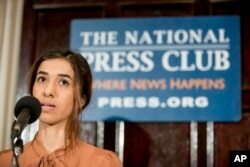 FILE - Nadia Murad, co-recipient of the 2018 Nobel Peace Prize, speaks at a news conference at the National Press Club in Washington, Oct. 8, 2018. The investigators will gather evidence on war crimes, crimes against humanity or genocide for use in Iraqi courts that will hold trials for IS militants, according to the U.N. resolution. The United States announced it will provide $2 million to support the work of the investigative team, known as UNITAD, the U.N. investigative team to promote accountability for crimes committed by Daesh, an Arabic acronym for IS.